Russian President Vladimir Putin, expressing his appreciation over the transformation taking place in Sri Lanka, assured that he will provide every support to Sri Lanka. He made these remarks when he met President Maithripala Sirisena on the sidelines of the BRICS Outreach Summit on Sunday in Goa, India. 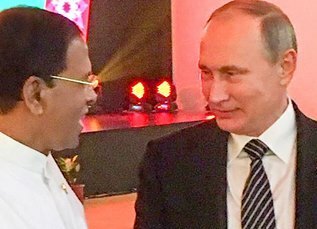 President Putin warmly welcomed President Sirisena and expressed his best wishes. President Sirisena thanked the Russian President for the unconditional support extended to Sri Lanka at the United Nations Human Rights Council. He assured that the government is fully committed to further enhance the friendship between the two countries. Meanwhile, the President also met with the Chinese President Xi Jinping in India on Sunday . During the meeting, both leaders discussed ways and means to further strengthen the existing close relationship between the two countries as well as regarding the preparatory works of the ceremony to be held in Sri Lanka to celebrate the 60th anniversary of the Sri Lanka-China friendship. The President also appreciated the assistance given by the Chinese government in preventing kidney disease in Sri Lanka and further discussed the programmes to be implemented on the prevention of kidney disease in parallel to the 60th anniversary celebrations of the Sri Lanka-China friendship. He also appreciated the assistance given by the Chinese government for the Moragahakanda Development Project and added that the development projects being implemented in Sri Lanka by China is a more support for the strategic development of Sri Lanka. Expansion of import and export activities between the two countries was discussed in detail.